“QUARANTINING” intensive care beds for elective surgery patients and better work conditions for ICU nurses are on a wish list of solutions proposed by senior Australian experts to the ongoing problem of elective surgery cancellations. General surgeon Dr Philip Truskett, chairman of the skills education committee of the Royal Australasian College of Surgeons, said there were frequently delays in starting elective surgery cases because of a lack of beds in the ICU which, in turn, were often not freed up because of a lack of beds in the wards. Such delays were “incredibly fatiguing” to the surgical team, he said. “You’re a bit like an athlete at the starting block and then you have 20 false starts… and by the time you get the patient to the operating room, you are physically exhausted,” he said. Dr Truskett said solutions would include quarantining ICU beds for elective surgery cases and also freeing up ICU beds by moving patients waiting for a ward bed to a recovery ward in the interim. Professor Steve Webb, senior staff specialist in intensive care medicine at Royal Perth Hospital, said insufficient ICU beds on a per capita basis were the major cause of cancellation of elective surgical cases. “In many places this is not a simple resource issue but, rather, reflects a shortage of ICU nurses whose conditions of work are not sufficiently attractive to retain them within the hospital system,” he said. 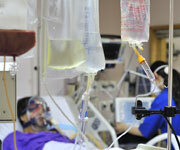 “Exit block”, where patients in the ICU were well enough to be discharged to the ward but there were no beds available, was also a contributing factor in some hospitals. However, most ICUs that had tried reserving dedicated beds for elective surgical patients had found it did not work, Professor Webb said. “Faced with a critically ill patient and the only available bed is one reserved for tomorrow’s surgical elective admissions, it is natural that the bed is provided to the patient who needs it most urgently,” he said. Balancing theatre lists throughout the week to even out the requirement for post-operative beds might help a little, he said. Dr Deepak Bhonagiri, an intensivist at Liverpool Hospital, Sydney, and lead author of the MJA article, said reduced staffing levels in hospitals after hours could be one of the contributing factors to problems experienced in the ICU. Hospitals were still built around the 9–5 principle so there were aspects of hospital staffing that significantly changed after hours, Dr Bhonagiri said. The MJA study of 245 057 admissions to 41 Australian ICUs from 2000 to 2008 found a significantly higher risk of mortality in patients admitted to the ICU after hours (6 pm–6 am). The study, a retrospective audit of the Australian and New Zealand Intensive Care Society Adult Patient Database, also found weekend ICU admissions had a 20% hospital mortality rate compared with 14% of patients admitted in hours. The difference was most marked in elective surgery patients. This was despite the fact that a minority — less than 20% — of elective surgery patients were admitted to ICU after hours. Dr Bhonagiri said the study did not investigate causation but the findings suggested hospital medical staff should be aware that special care may need to be taken with elective surgery patients admitted after hours. “People might think if they are doing elective surgery and it is getting too late, should they think about doing it during [normal] hours,” he said. “The surgeon [who starts] operating from eight o’clock who is going to start a new patient at three o’clock — who is quite complex and requiring intensive care — might suddenly think that maybe he should postpone it for when he is fresh. Professor Webb said the outcome for elective admissions was generally better than patients admitted as an emergency and so it was surprising to see this group driving an effect on mortality. “It may be that the involvement of more experienced clinicians, both in the ICU and prior to ICU admission, may improve outcome,” he said. Professor Webb and Dr Bhonagiri both said Australia was one of the safest places in the world to have surgery either during or after hours because the mortality rates were very low. 1. Med J Aust 2011: 194: 287-292. More beds are needed in all areas – emergency departments have similar problems to ICUs because they can’t move patients out. After hours staffing issues also apply to nursing staff. In office hours educators, clinical facilitators and the unit manager are available to assist in an emergency until extra staff can be called in. However, after hours there is not that immediate assistance and it is often very hard to find qualified staff. This problem exists not only in ICUs but also in maternity units where qualified staff and beds are at a premium. Doing elective surgery at a sane hour would certainly help (common sense really, like not commencing induction of labour after hours), but bed numbers and staffing are the key issues. Agree that surgical throughput would be improved with designated elective ICU beds, but if bed numbers don’t increase this will mean less access for emergencies. If anything, any designated elective beds must be NEW beds in ICU, as it really can’t be justified to have a bed sitting empty overnight in ICU waiting for an elective patient when you have an intubated patient on inotropes in ED. I once asked what is the correct ratio of ICU beds in a community and nobody could tell me. I have read that in the USA it is thought to be 10 per 10 000 head of population and then elective surgery could function safely and minimise risks. Any comment? Recruiting and retaining staff in ICU is a major problem. Having worked in ICU for 25 years and working very hard, the minute there was a bit of down time, you were sent to relieve in wards. There was never any slack in the workload so other important work like policy and quality was not done, or rather all done at home. After years of working this way, I and many others like me just became exhausted and left. Improved working conditions in this high pressure field would certainly assist to address the above issues.